On Thursday evenings I go out to my ladies’ accountability group with some friends. Last Thursday, when I got home, I was surprised (and happy!) to see that my husband had made a meal plan for 6 weeks! Along with a list of side dishes and a grocery list for each week, plus how much it would cost! If we can stick to the menu plan, the next 6 weeks of suppers should cost us less than $200..this is including the cost of milk for the kids and fruit..wow! One of my meals from last week was homemade hamburger helper..I decided to make some to freeze, and had enough left over to freeze 2 meals! We’ll see how this turns out thawed later..I’m never sure how pasta will come out after it’s been frozen. Wow – your husband is probably the envy of many women. With today's economy, it's so important to look for ways to be frugal. Great idea with the meal planning for six weeks! 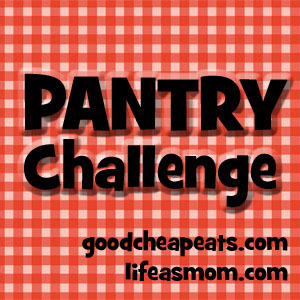 I've been enjoying your pantry challenges. Pasta usually freezes well. Sometimes I purposely make extra meat for a meal and take out the extra to freeze before I add the rest of the veggies, pasta, etc. That makes a good start for the next time I want to make the meal or I can make something completely different, just because I have the meat ready to go. I just make sure to label it well in my freezer so I can figure out what is in the container I am looking at. Cute blog! Following through Bloggy Moms! Bowquet it's just a challenge that I found several other blogs doing that basically, you eat what you already have instead of buying more at the grocery store each week. So you go through your freezer and pantry and make meal plans for the week with what you have, only buying perishables as much as possible like milk and eggs and fresh veggies. I've found it to be a great way to be kept accountable to not buying too many extras!